Distribution and habitat: Araucaria heterophylla is native to Norfolk Island, a sub-tropical island in the Pacific Ocean between Australia, New Zealand and New Caledonia; the Araucariaceae are a very ancient family of conifers originally existing almost world wild but became extinct in the northern hemisphere. 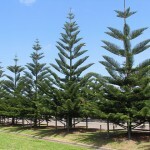 Araucaria heterophylla is a beautiful tree of symmetrical, pyramidal shape, up to 65m tall (210 feet) in its native habitat, with straight vertical trunk, up to 3m diameter (10 feet), and regular tiers of short, horizontal, spreading branches; leaves crowded on branches, juveniles of needle or awl-like shape, adults scale-like and ovate; male cones oblong, to 5cm long (2 inch); female cones erect, usually sub-globose, 10-12cm long (4-5 inch) and 12-15cm diameter (5-6 inch); seeds oblong, winged, up to 3cm long (1 inch). 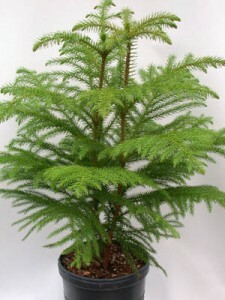 Description: This conifer is rarely exceeds 1-2m (3-6 feet) indoors, where it grows very slowly – no more than 15cm (6 inch) a year. Its branches with tiny needles clustered together in fan shape are arranged in tiers. New growth – which is normally produced in spring – is a bright fresh green and this colour is held until the autumn, when it darkens. 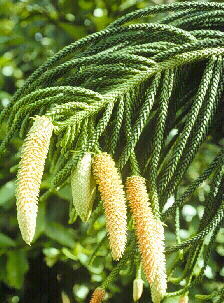 The branches are heavy but they do not need to be given any extra support, since the main stem turns woody in time. 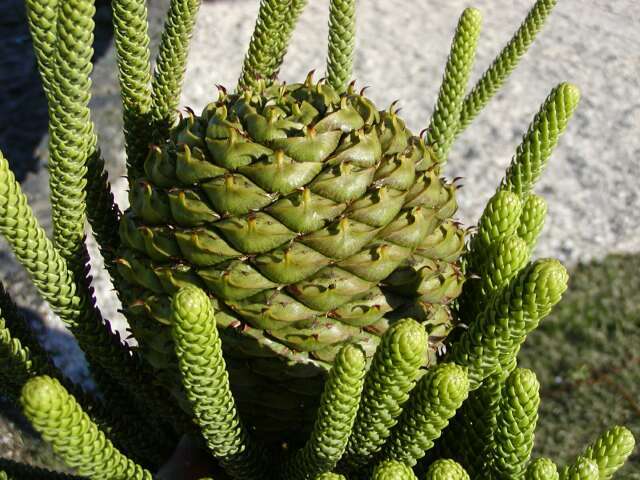 Houseplant care: Do not trim or prune the Araucaria heterophylla. Never cut off the top or trim the sides of this plant. It does not need to be shaped at all. Remove any lower branches that die, using sharp pruners to prevent tearing the stems. If moved outdoors for the summer, keep it shaded from hot sun. Keep the potting mixture moist at all times. 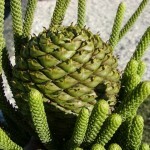 Araucaria heterophylla is frost tender. Bring it back indoors if the temperature drops below 10°C (50°F). Light: Araucaria heterophylla do best in medium light. They should not be placed too far from the window, however, or their needles will fall. Turn the plant regularly to encourage symmetrical growth. Temperature: A wide range of temperatures (ideally 7-24oC (45-75oF)) can be tolerated. 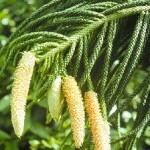 Above 27oC these conifers must have high humidity; mist-spray the foliage occasionally. Provide some ventilation or stand outside during the summer months. Watering: During the active growth period water plentifully, as often as necessary to keep the potting moisture thoroughly moist, but never allow the pot to stand in water. During the rest period water moderately, enough to make the potting mixture thoroughly moist, but allow the top 2-3cm (0.8-1 inch) to dry out between waterings. Fertilising: Apply liquid fertiliser to the potting mixture every two weeks in the active growth period. Potting and repotting: Use a soil based potting mixture. Repotting should be needed only every two to three years, but plants can be moved in spring whenever the roots appear on the surface of the potting mixture or through the bottom of the pot. Since the shape of the plant deteriorates over a height of 1.5m (5 feet), it is best kept pot-bound to restrict the growth. 13cm (5 inch) pots are normally the largest necessary, but larger specimens may require 15cm (6inch) or even 20cm (8 inch) pots. After reaching the maximum convenient pot size, top-dress in spring. Gardening: Araucaria heterophylla is very tender and will begin to sustain damage at temperatures below 4ºC (40ºF) beginning with discoloration of foliage. Plant it outdoors only within its recommended hardiness zone. It is not particular about soil and tolerates even very acid soils as well as salty situations at beach side, but good drainage is essential. It grows well in deep sand, as long as it receives reliable water when young. Plant it in full sun. It will tolerate shade but the leaves will drop – the deeper the shade, the droopier the leaves. It is necessary for the species to be grown in oceanic coastal areas because bodies of fresh water do not provide enough precipitation, moisture, consistent wind levels and no saline air which are all things the species requires. Propagation: Commercially, plants are grown from seed or cuttings, but neither method is practical for the indoor amateur grower. Although it will take several years to reach the size of a purchased plant. Cuttings taken from vigorous upright material will inherit normal upright growth habit, but cuttings taken from horizontal branches will root, but will maintain horizontal growth habit rather than normal upright growth. Problems: Problems usually occur as the result of incorrect treatment. Falling needles may indicate waterlogging, an atmosphere that is too dry or exposure to sun. Mealybugs are the most common pests of Araucaria heterophylla. Watch for white, cotton-like areas on leaves and stems. 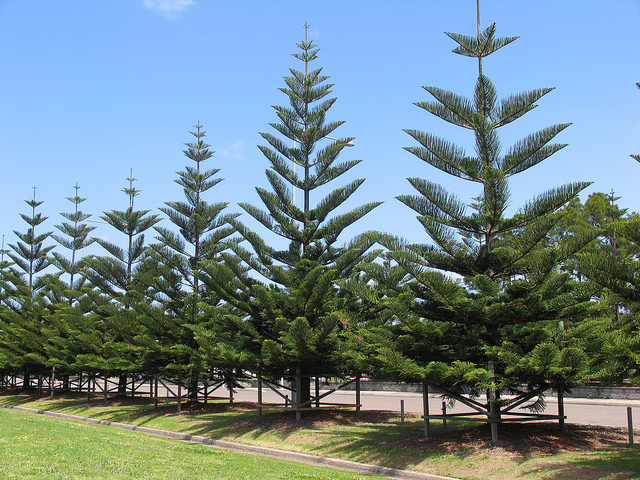 Uses: Araucaria heterophylla is tolerant of salt and wind, making it ideal for coastal situations in tropics and subtropics regions, also becoming very popular ornamental tree in gardens, planted singly or in avenues. Araucaria heterophylla are the only ones from this genus grown indoors. They make attractive groves and are happily at home in containers indoors and out. Sometimes are used as ecological Christmas trees as they are not dumped after holidays. Notes: Do not give up to easy on Araucaria heterophylla. The tree will recover – cut it back to the ground to force new undamaged suckers to form. Toxicity: Some people may experience a strong allergic reaction if they touch the leaves.